I was cleaning my daughter’s room a few weeks ago for her. She had done the first “purge” and had said I could finish up. Although cleaning, decluttering and organizing is a lot of work, sometimes you find special treasures or memorabilia that make you smile. 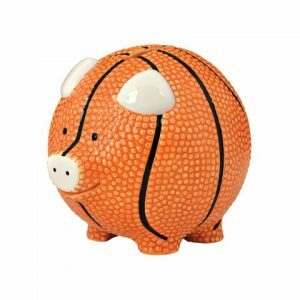 I found her piggy bank, shaped like a pig but wearing basketball skin. (Gave a whole new meaning to a “pig skin”. haha ) And this piggy bank was full of change. I could hardly lift it with one hand. It brought back memories of when she was little running straight to her piggy bank after grandpa gave her a quarter. She would get change for doing a simple chore and off she would run to her piggy bank. As she grew older that bank became the holder of the change from McDonald’s and a place to put that annoying penny that you didn’t want to throw away. It had a special place on the dresser as if disguising itself among the other basketball décor. When I found it tucked away with some other things, I wondered if she even remembered she had it. She had saved and saved those coins. What was she saving them for? A rainy day? A just-in-case fund? Saved-so-long-you-forgot-about-it stash? Funny how we do the same thing with Jesus. We get His blessings and His direction and we store it away like we had better save it for a rainy day. We act like we may not get more and we had better not use it up now. We are afraid to show our faith on the little things but wait until we are with other believers or until something tragic happens. What are you saving Jesus for? There is plenty of Him to go around. He gives out blessings everyday. We build faith everyday. He gives us experiences in Him to help others believe. You don’t have to have a piggy bank to save up His love to pull out when times get bad. You don’t have to wear a disguise to fit in the world’s décor. Nope. You just have to live your faith and share your savings with others. I ask you again………what are you saving Jesus for? Break open that bank today and share your stash with someone. It will be the greatest savings ever spent. This entry was posted in devotional, inspirational, motivational, spiritual on April 25, 2017 by Deanna Young.